If you wish for something more filling, you can get the Caviar Burger Slider (Papierusse, Butter Lettuce, Fried Egg, Caviar Aioli, French Fries - $15). 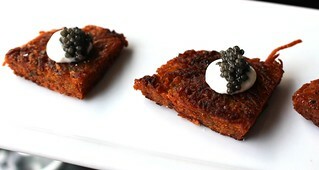 The papierusse is a sheet sous vide caviar produced by Petrossian, which makes it less messy to add caviar to something like burgers. 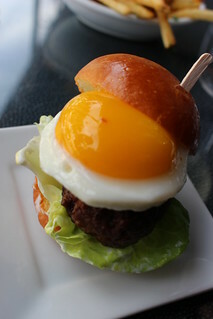 Thanks to the size of the slider, you get that much more runny yolk per burger, as well! 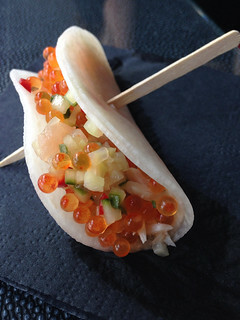 I liked biting into the crisp, cool jimaca shells, which complements the delicate trout roe quite well. 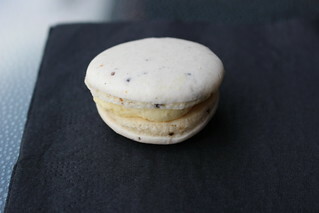 Head over to the sweets section and try their white chocolate caviar macarons! This is a unique take on that sweet and savory combination that has been proven popular with things like chocolate bacon or salted caramel. 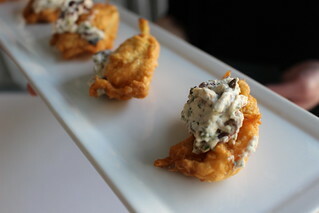 Petrossian's happy hour menu is available Monday-Friday from 4-7pm. 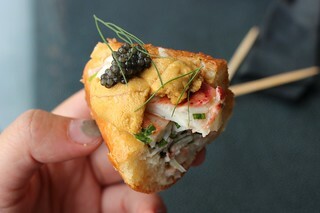 Have you ever tried any of the happy hour restaurant newport beach? I am trying to find some good southern California restaurants.